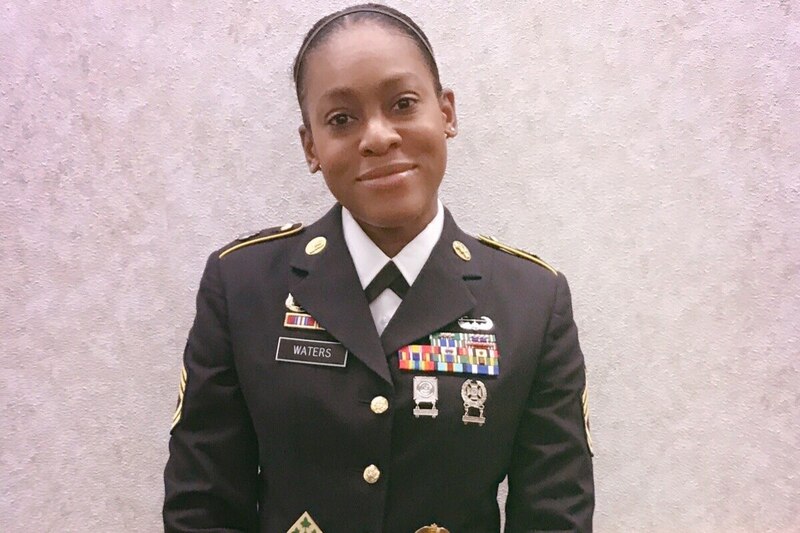 A Fort Knox noncommissioned officer claims she was acting in self-defense when she stabbed a civilian woman in the leg at a gas station back in February. And her command is standing behind her. According to a security camera trained on the Kentucky gas station where the altercation took place, Sgt. 1st Class Kai Waters was sitting in her car on the evening of Feb. 22 when a woman threw open the door and attacked her. “I wanted to get out and rush into the gas station, where there would be other people who could help me get this strange woman away from me,” she wrote. Waters, 33, said she was making a 911 call to report the woman, who had been tailgating her on a nearby highway ― at one point tapping her and leaving grey paint on the white bumper, then hurling racial slurs and other abuse at the soldier while stopped at a light ― before following Waters to the gas station, as detailed in an April 6 Facebook post. After Waters exited the car, the woman continues to accost her, and the soldier swings her arm and kicks to hold the woman off. The soldier was holding a knife, she said, which she jabbed into the woman’s leg at some point during the altercation. It’s not clear from the footage when that occurred. As Waters read off the woman’s license plate to the 911 dispatcher, she wrote, police arrived and immediately arrested the soldier and placed her in the back of a squad car. She was later charged with second-degree assault. Waters, who is assigned to Human Resources Command at Fort Knox, works in career management for the chemical, biological, radiological and nuclear specialist military occupational specialty, according to service record information provided to Army Times by HRC on Friday. She has deployed once each to Iraq and Afghanistan, has served as a drill sergeant, and among her awards are seven Army Commendation Medals, a whopping 12 Army Achievement Medals, and four Good Conduct Medals, each one presented after three years of unblemished service. Waters believes that her job ― and her race ― were a factor in how she was treated. “As a soldier and a senior noncommissioned officer, and a black female, it was clear that I was automatically identified as the assailant,” she wrote. A judge ordered her to be confined to Fort Knox ― and required to live in the barracks, despite renting a private home off-post ― in addition to undergoing a mental health evaluation. A local news station picked up a story three days later, crediting Officer Cody Clinton, the first on the scene, with saving the unidentified woman’s life. A grand jury reviewed the case on March 8, Waters wrote, and she is awaiting their decision to send her to trial or drop the charges. In an interview with Waters and her attorney, Jeremy Aldridge, posted Tuesday, Aldridge told the station he had a hard time believing there would be an indictment based on the available security footage.